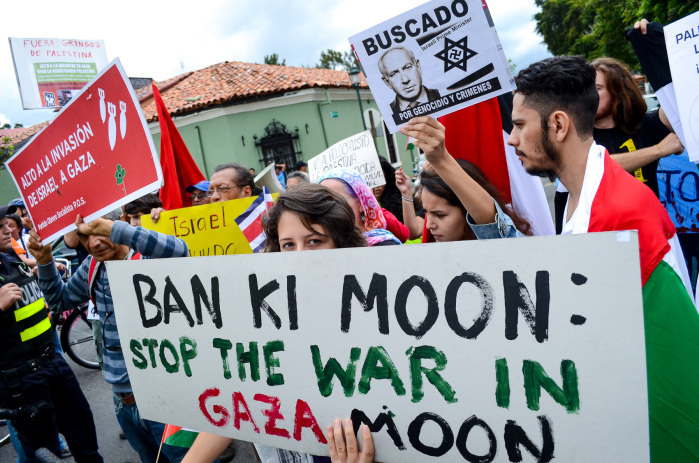 The four-week long conflict between Israel and Gaza dominated United Nations Secretary-General Ban Ki-Moon’s arrival in Costa Rica Wednesday as news of the destruction of a U.N. shelter in the Gaza Strip came to light. Costa Rican President Luis Guillermo Solís issued his most complete stance on the conflict during a welcoming ceremony for the U.N. chief at Juan Santamaría International Airport Wednesday morning. “We demand an immediate ceasefire, sheltered by the United Nations, the countries of the Quartet [United States, Russia, European Union, Arab nations], which permits an exit from this maelstrom of blood that offends humanity,” Solís said during his remarks. The president said that Costa Rica would support any efforts by the U.N. to resolve the 23-day conflict, which has claimed over 1,300 Palestinian lives. On the Israeli side, the conflict has cost the lives of 56 Israeli soldiers and two civilians. “Women and children were asleep where they were assured would be the safest place,” the U.N. chief said later in the day at Costa Rica’s Foreign Ministry. At least 16 died in the shelling and more were injured, according to Ban Ki-moon. The secretary-general said that the coordinates of the school had been communicated to Israel Defense Forces. Israel has insisted it is taking extraordinary care not to hit civilians, and gives them warnings to leave areas it plans to attack. As many as 200,000 Palestinians have sought refugee in U.N.-run schools and shelters. Ban ordered both sides to respect U.N. territory and said that the attack was a serious violation of international law. 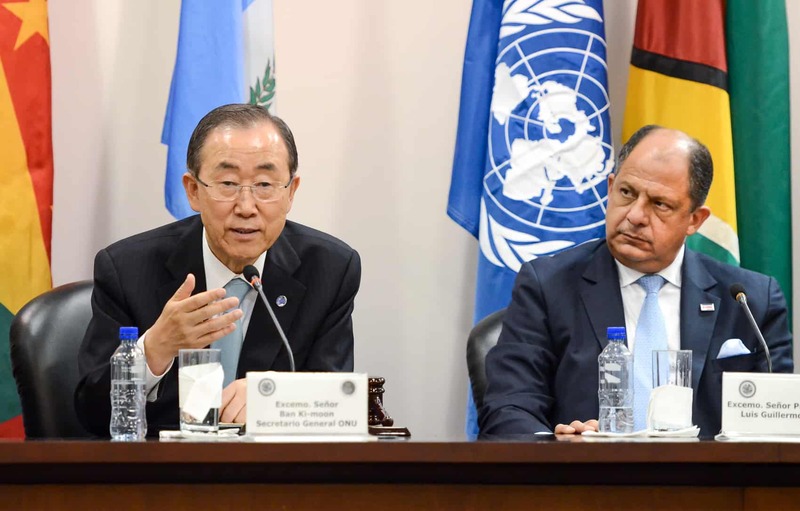 During a press conference at the San José-based Inter-American Court of Human Rights, the secretary-general focused his remarks on the need to guarantee human dignity in the conflict and noted that both sides had to answer for the violence. “Israeli people should not live under constant threat and constant fear not knowing when Hamas rockets will fall on their houses. At the same time, Israelis cannot let Palestinians live in eternal occupation, eternal siege,” said the U.N. chief. Protesters mobilized in several parts of San José, including the Fuente de la Hispanidad in San Pedro, the IACHR in Los Yoses and the Casa Amarilla in Barrio Amón. Solís spoke with one group outside the IACHR, who asked the president to send an ambassador to Palestine. Costa Rica established diplomatic relations with the state of Palestine in 2008, during President Óscar Arias’ administration. Solís said he had not considered the idea but did not rule it out. “If the situation continues as it has, the world, not just Costa Rica, is going to have to take increasingly strong measure to protect the lives of the weakest who are being bulldozed by an attitude that does not agree with the values that the government of Costa Rica defends,” Solís told protesters. Foreign Minister Manuel González struck a similar tone when asked if Costa Rica would pull its ambassador to Israel, Rodrigo Xavier Carreras, saying that Costa Rica has not ruled out any options to make its voice heard to end the conflict. Several Latin American countries, including Chile, Brazil, Ecuador, El Salvador and Peru have called back their ambassadors in protest during the last week. “In the name of our common humanity, the fighting must stop now,” said Ban Ki-moon at the Casa Amarilla. The secretary-general also highlighted Costa Rica’s international disarmament efforts and offered its successful record on forest conservation and environmentalism as an example to the rest of the world. Ban Ki-moon meets with indigenous leaders Wednesday afternoon. He plans to stay in Costa Rica until Aug. 4.